Here at Smart Service, we understand the work it takes to manage a contractor company. From keeping track of your technicians’ salaries to making sure your invoices don’t get lost on the way to the office, you need a contractor software that can work for you. Smart Service, a software for contractors, integrates with Quickbooks to allow easy logging of invoices, jobs, and orders. There’s no need for painstaking and time-consuming data transfer either. Everything on QuickBooks immediately goes on to Smart Service, and everything done on Smart Service can be easily loaded onto QuickBooks. With QuickBooks-integrated contractor software, managing your invoices has never been easier. Now your contractors can worry less about keeping track of all the minutia, and spend more time making the sales. With Smart Service software for contractors, you can send out your technicians on jobs and not have to worry about losing or damaging invoice sheets. The Smart Service mobile app for contractors allows your company to go paperless. That’s right: an office without papers. Not only does this mean no more lost logs, but your invoices get uploaded from the app directly to Smart Service and then to Quickbooks. Who knew going digital was so easy! Smart Service contractor software integrates seamlessly with QuickBooks. This means there is no need for double data entering! Whatever information gets logged by your technicians or your office (customer data, invoices, product parts, etc.) gets uploaded into QuickBooks as well! Smart Service software for contractors essentially becomes another office manager, keeping track of all the information quickly and efficiently. Talk about productivity! Using the Smart Service software for contractors, you can schedule jobs using your existing customer data. 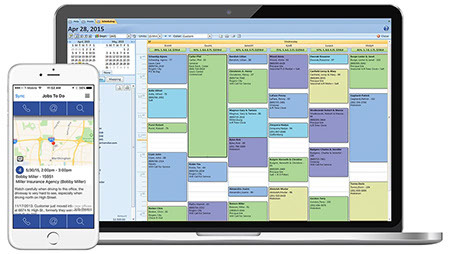 Our scheduler is easy to use, so you can incorporate it into your contractor operations right away. Easy breezy. Through Smart Service scheduling for contractors, you can manage job timing, breaks, and payments so accounting on QuickBooks is simple and all your contractors are paid without headaches. Go digital—no more forms lost to coffee stains! Integrate your schedule with QuickBooks! Request a demo today to see the best contractor scheduling software for QuickBooks. Smooth sailing is just a click away! Better manage billing and scheduling. Improve productivity with Smart Service contractor software. Want to learn more about how to service your contractor business smarter? Check out some more tips and tricks!